Hey there! Thanks for dropping by Chez Edouard! Take a look around and grab the RSS feed to stay updated. See you around! After conceiving of this dish it took a couple of attempts to finally achieve success. In my first effort some of the crepes were too thick and weren’t usable. Additionally, I only used pepperjack cheese which made the dish too dense. And finally, the veloute sauce didn’t turn out the way I had imagined. So, tonight it was back to the drawing board for a second try that I’m happy to report turned out much better. I made sure that all of the crepes were thinner by using less batter for each. I mixed the pepperjack cheese with some ricotta to lighten the stuffing mixture. And, I tweaked the veloute sauce. For those who are unfamiliar with a veloute, it is similar to a béchamel with the exception that stock (traditionally meat stock), takes the place of milk. But my experiment involved a housemade vegetarian corn stock and puree. (See below for details). Cut the kernels from two fresh ears of corn and place in a large saucepan. Add the corn cobs (yes the cobs) and enough water to cover. Bring to a boil, reduce the heat, and simmer for 30 minutes. Allow to cool. Remove the cobs and discard. Strain the remaining ingredients reserving the stock and the corn kernels. Place the corn in a blender with about half the stock and puree until smooth. Strain through a fine sieve and reserve the rather loose puree. Meanwhile, melt two tablespoons of butter in a saucepan. Add two tablespoons of flour and whisk until the mixture is foamy. Take great care NOT to allow the flour to color. You want to create what is known as a blonde roux. Slowly add the reserved corn stock whisking over low heat until thickened to the consistency of heavy cream. Just before serving, stir in the loose puree and heat through. Add a pinch of salt but do NOT add pepper (which can overpower the delicate flavor of this sauce). My favorite pizza can really only be made in the summer when fresh, vine-ripened tomatoes are available. And that’s about all there is to it: sliced fresh tomatoes, caramelized onions, fresh mozzarella, and a garnish of chopped garlic and parmesan cheese. Of particular note is the mozzarella. To the uninitiated, the term “fresh” is in reference to the type of cheese. Fresh mozzarella is altogether different from the firm blocks of the aged variety you find at the regular cheese counter that produces a stringy, often rubbery texture after melting. You may have to search for fresh mozzarella among the specialty cheeses and it is often sold in a ball shape. It will be noticeably softer (in fact squeezable), and has a wonderfully creamy texture when melted. The order of the toppings as you place them on the dough is also important because sliced fresh tomatoes can be a bit juicy. To avoid a soggy crust, start with the mozzarella and onions, then add the tomatoes and garnishes. A chiffonade of basil can also be strewn about if desired, and a pinch of red pepper flakes sprinkled over adds a bit of kick. I never want anything else when I have pizza…not even a salad. But later in the evening I do indulge in something sweet. To paraphrase Alice Waters, the difference between good lasagna and great lasagna is in using fresh, thinly-rolled pasta. And I agree. Try to avoid those boxes of thick noodles with the curly edges on the grocer’s shelf if at all possible, but if you must use dried pasta, search for the Barilla brand noodles which are thin and flat. The sauce that I created for this dish is made of fresh tomatoes, onions, peppers, summer squash, garlic, and carrots–chopped, diced, or shredded and simmered together until thick. Half of the mixture is blended into a puree and the rest is left in its chunky state which adds heft to dish. Layers of sauce, pasta, and cheeses (in this case ricotta and pepperjack) are sandwiched together to make for a tasty vegetarian entre. Throughout the year I create variations on tonight’s menu, something I call a “tuna noodle toss.” It always includes tuna and pasta but those are the only “rules.” Sometimes I use fresh grilled tuna, sometimes good-quality canned; often the pasta is dried, and on other occasions (such as tonight), it’s freshly-made. This is another one of those meals where I simply pull out the ingredients I have on hand and start to think about combinations of flavors that might work well together: tiny French green beans…tomatoes…peppers. After the pasta is made, which can be done in advance, this is easy and quick to pull together. It’s almost like a warm or room temperature pasta salad and to my mind is a one-dish meal. Yesterday I made a blueberry-lemon pound cake which turned out quite well, so that will be dessert. In those menus where “vegetable plate” is included in the title, it’s pretty much just that–a plate of vegetables. But it is anything but haphazard in design. I strive to achieve an interesting balance of tastes and textures on the plate that appeals from a gustatory as well as visual perspective. And I like to try new and interesting combinations. The highlight of tonight’s menu is a bean and tomato dish that I created simply because I thought the flavors would be nice together. And they were! A few thin slices of onion and a peeled and chopped yellow tomato went into a skillet with a bit of olive oil and stewed together over low heat until the tomatoes were saucy but still chunky. Meanwhile, sliced Romano beans were blanched briefly in boiling water until just crisp tender. At that point the beans are drained and added to the skillet with the tomato mixture and everything is heated together for just a minute or two before serving. A bit of sea salt and a grinding of fresh pepper was all that was needed to finish the dish. Superb if I do say so myself! What would summer be without one (or two or three) burger menus? And there’s nothing new here in terms of the individual components. What IS different is in how each is prepared. Tonight’s burger is made of turkey seasoned with minced garlic, topped with pepperjack cheese, garden tomatoes, grilled onions, and served on a housemade yeast roll. The potato salad features the addition of chopped bread and butter pickles benefitting from the pickled flavor not only of the cucumbers but the onions and peppers also. Corn on the cob is steamed in a rack over simmering water just until hot and served with chili butter. So with just a few twists in how each item is prepared, you end up with something a bit different than the traditional. A note about the corn. A quick steaming is one of my favorite ways to prepare corn on the cob. It prevents the natural sugars in the corn from being leached into a boiling liquid, and the kernels remain full of flavor and juice. If you plan a bit ahead, the dessert is simple. Place the frozen peaches in a blender with some milk, cream, sugar, and a few drops of vanilla, process until smooth, and voila! No need to make ice cream. Fresh okra was available at the farmers’ market this weekend and I bought a sizable amount to enjoy. In the south this vegetable is often enjoyed breaded or battered and deep-fried. And I do like it served that way which provides textural interest to a summer mixed vegetable plate. But another well-loved dish that comes to mind is the Louisiana favorite–gumbo. Most gumbo recipes include some sort of meat protein and certainly do not need to include okra. What does seem consistent however, is that those that include okra usually omit the traditional flour paste roux. Okra has a thickening property that produces a similar result to that of the roux. My vegetarian version celebrates the bounty of midsummer. For dessert, a peach pie that’s a bit different. The bottom crust is made of traditional pie dough, but the top is covered with crisp topping including ground pecans, brown sugar, flour, and butter. So what does this photo have to do with tonight’s menu? Nothing really. 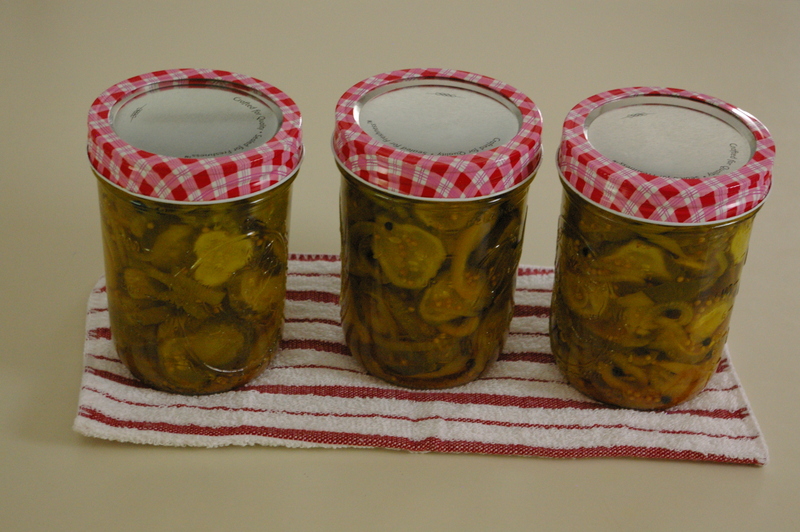 But yesterday I made these jars of bread and butter pickles and this morning I felt inclined to take a photo. Next fall and winter, I’ll be enjoying these as well as the dill pickles that I have been preserving along the course of the summer thus far. I’m anxious to make relish next weekend. But on to tonight’s menu. On a hot summer day, a soup is probably the last thing most folks would think of cooking for dinner, but the abundance of fresh produce makes this a particularly wonderful time to combine the vegetables on hand with some fresh water, simmer until the flavors marry, and serve with a cornmeal muffin and a side salad. Simple, direct, and of the moment. The highlight of tonight’s menu is a recipe I devised based on a couple of others. 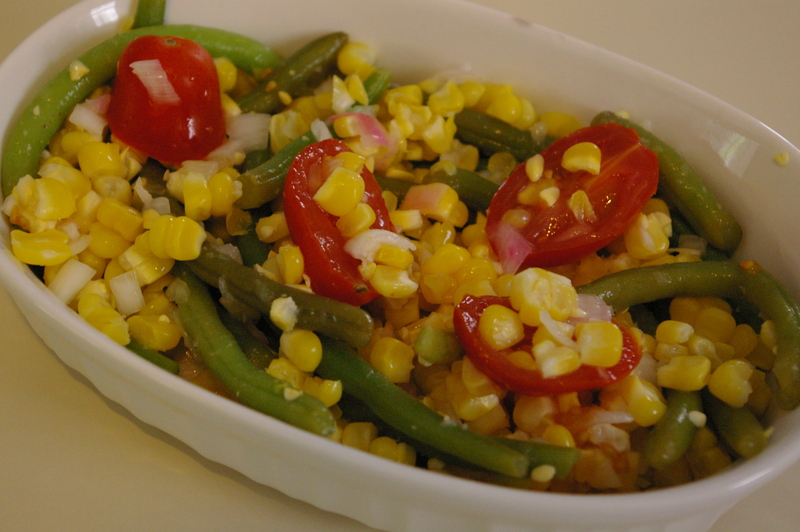 Beautiful corn, green beans, and cherry tomatoes were available at the farmers’ market, and I was inspired to create a chilled salad as an accompaniment to the grilled fish. It’s simple and relatively quick, and must be made in advance. The dressing for the salad has no oil–it’s simply rice vinegar, sugar, and a pinch of salt with some minced red onion. A chiffonade of basil is tossed in just before serving. Light, refreshing, delicious, attractive. The vegetarians among us may be tempted to feast on the salad alone! Tonight’s menu features a “stuffed pizza” otherwise referred to as calzone. Three cheeses–fresh mozzarella, parmesan, and ricotta–are layered with sautéed onions and peppers, artichoke hearts, cherry tomato wedges, and olives and seasoned with garlic and herbs. It’s one of those one-dish meals that needs little to accompany it. For those with big appetites, I imagine a simple salad would suffice. As with any pizza, whether the traditional type or stuffed as is the case here, it is important to make sure that the oven is thoroughly preheated to the hottest temperature setting. This helps to insure a crisp bottom crust. In the case of tonight’s treatment, it is also important to place the mozzarella and vegetables on the bottom and leave the herb-seasoned ricotta for the top layer, thus preventing a soggy crust.